Fourth-year forward Ellie Greiner shoots a three pointer against the University of Rochester at Neon Night earlier this year. 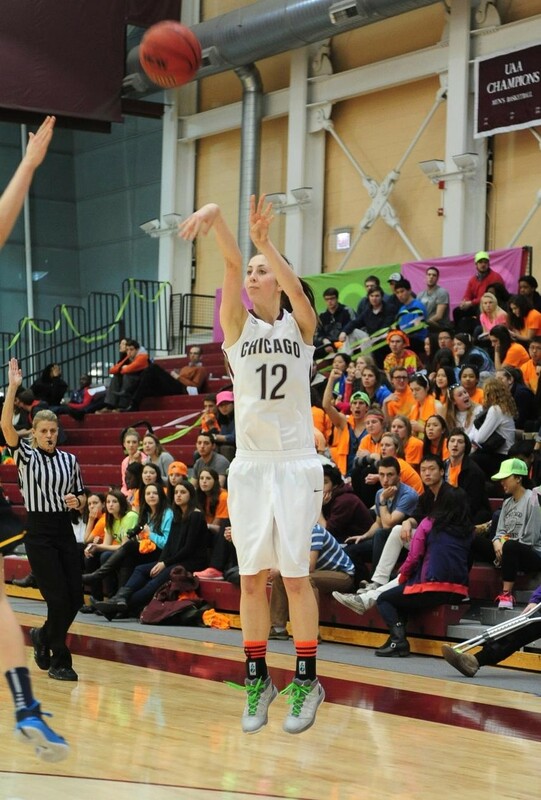 In two high-stakes matchups, Chicago defended its home court against both Brandeis (13–11, 5–8 UAA) and No. 11 NYU (20–4, 9–4 UAA). The pair of victories will keep Chicago atop the UAA heading into its final game and guarantee it at least half of the UAA title. On Friday, the Judges got the game started with a basket just four seconds after tip-off. They continued pouring in the baskets, holding an 18–11 advantage after roughly 12 minutes of play. But the difference in quality between the two sides proved too much. Chicago countered with 15 unanswered points in just the next five minutes. For a moment, Brandeis looked poised to take back the lead. By halftime, however, the teams were separated by 14 points. Chicago never let its foot off the gas in the second half. Time and again the Maroons found themselves under the basket for easy lay-ins. When they weren’t scoring from down low, the South Siders made their way to the charity stripe to earn some easy points. Halfway through the second half, Chicago was up by 31 points. The Maroons buried their opponents with stellar shooting from every part of the court. They made nearly 56 percent of their fields goals, shot 38 percent from behind the arc, and missed only three of their 13 shots at the free-throw line. The final score, 86–69, made the game seem more respectable than the second half may have otherwise indicated. By game’s end, four different Maroons had reached double digits: third-year guard Caitlin Moore, fourth-year guards Claire Devaney and Morgan Donovan, and fourth-year forward Ellie Greiner scored 58 of Chicago’s 86 points. Sunday’s visitors proved to be the tougher of Chicago’s two opponents. The teams traded baskets through the first 14 minutes of play. With just two minutes left in the first half, Chicago held a five-point lead. However, a three from first-year guard Elizabeth Nye, free-throws from second-year forward Britta Nordstrom and Donovan, and a jumper as time expired by Devaney gave Chicago an 11-point advantage by the end of the first half. The stingy defense was even more so in the second half of regulation. Points were hard to come by for either team. NYU made just 19 of 54 shots; Chicago did little better, knocking down 21 of its 55. The smallest of issues proved to make the difference; Chicago made four more threes than its opponents did, and knocked down 82 percent of its free throws compared to the Bobcats’ 68 percent, winning the game 66–55. Devaney, Donovan, and Nye paced the Maroons with 16, 17, and 15 points, respectively. They seemed immune to the airtight defense, each making at least half of their baskets. The two wins extend Chicago’s win streak to 12 games. The Maroons’ last loss came nearly a month and a half ago. Their opponent in that loss, however, will be their final opponent of the regular season. No. 9 Wash U is right behind Chicago in the UAA standings, with only two losses in conference play. While Chicago has already ensured itself a share of the UAA title, a win against Wash U will allow the team to claim the title outright. The entire season, then, will come down to the final game. After struggling in the early part of the year, Chicago found magic down the stretch. “[The team’s success is] the convergence of a lot of factors, in my opinion. None, though, are bigger than simply having six seniors with the same vision for the team, doing whatever they can do in their own ways to ensure our success. It’s a powerful dynamic,” said head coach Carissa Knoche. In their final season of play, these fourth-years will look to lead the team to victory and punch a ticket to the NCAA tournament. The final game will be at Washington University in St. Louis on Saturday at 1 p.m.